This Event List shows all types of McMurray Art League events in monthly calendar view. You can change the view to Week, Month, Year or List. Click on an event to see more details and register. Members should first log in to be offered the member price. You must register for the series or separately for each day you plan to attend. Hope you can attend. If not please provide a report we can share at the meeting. Spring show artists bring work to be screened. Pick up is same day after juror is finished. Be sure to follow League standards. Spring show artists pick up work screened by juror and Standards Committee. Show artists drop off work at venue. Register for the event to receive email reminder. Be sure to come to the reception Saturday May 4 2-4. Be sure to come to the reception on TBD! Show hours the same as library hours: Monday-Thursday 9-9; Friday 9-5; Saturday 9-4; Sunday 12-4. Come enjoy food, fun and great art! Pastel landscape techniques. Learn the concepts and techniques of classical art; space, light and atmosphere. Color, composition , form, textures and pastel techniques will also be discussed and demonstrated. Individual instruction. For a pastel list, Jim suggests getting a set of soft pastels from Sennelier; hard Nupastels and Rembrandt pastels; Conte pencils; blending stumps; pastel toned papers made by Sennelier or Ampersand. McMurray Art League general membership meeting. Speaker TBD. Show artists pick up work at venue. "Artistic You" Paint-Along - ACCOMPANIED KIDS WELCOME! Come learn to paint with Linda VanNewkirk! This is a class for beginner painters to learn to paint along with an instructor. 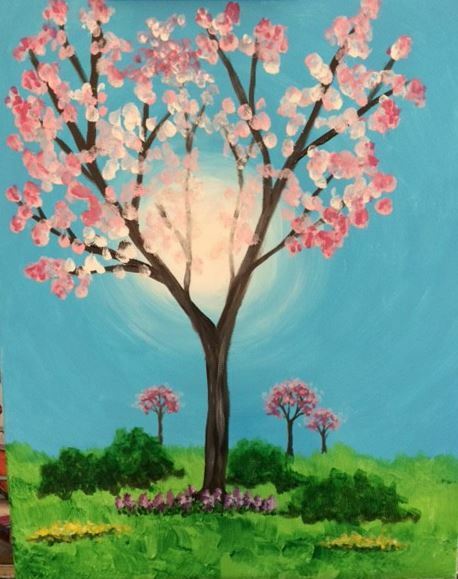 You will be painting your own version of a 16"x20" painting with a spring theme. All art supplies will be provided, including acrylic paint, brushes and a canvas. BYOB, if you want. Light snacks and beverages will be supplied. This class is geared for students interested in learning the wonderful world of watercolor. Some drawing ability preferred, for beginners to intermediate painters. Bring reference photos or magazine pictures to paint from. Sue also has photos to work from. Wednesday, March 13, 2019 Peters Twp. Library drop-off/pick-up "Radical"
Monday, March 11, 2019 Peters Twp. Library registration due 3/11 "Radical"
Wednesday, January 09, 2019 Peters Twp. Library pick-up "Playtime"
Saturday, November 10, 2018 "Artistic You" Paint-Along - ACCOMPANIED KIDS WELCOME! Monday, October 22, 2018 Peters Twp. Library registration due 10/22 "Playtime"
Wednesday, August 29, 2018 Deferred - Peters Twp. Library drop-off/pick-up "Mismatched"
Monday, August 20, 2018 Deferred - Peters Twp. Library registration due 8/20 "Mismatched"
Thursday, August 16, 2018 Outing to Little Lake Theatre "Steel Magnolias"
Wednesday, May 23, 2018 Peters Twp. Library drop-off/pick-up "Near and Far"
Monday, May 21, 2018 Peters Twp. Library registration due 5/21 "Near and Far"
Saturday, April 07, 2018 "Artistic You" Paint-Along - ACCOMPANIED KIDS WELCOME! Thursday, March 15, 2018 Peters Twp. Library drop-off "Salute to Nature"
Monday, March 12, 2018 Peters Twp. Library registration due 3/12 "Salute to Nature"
Saturday, February 10, 2018 "Artistic You" Paint-Along - ACCOMPANIED KIDS WELCOME! Saturday, November 11, 2017 "Artistic You" Paint-Along - ACCOMPANIED KIDS WELCOME! Wednesday, October 25, 2017 Peters Twp. Library drop-off/pick-up "Favorite Pastime"
Monday, October 23, 2017 Peters Twp. Library registration due 10/23 "Favorite Pastime"
Wednesday, July 26, 2017 Peters Twp. Library drop-off/pick-up "Unexpected Drama"
Monday, July 24, 2017 Peters Twp. Library registration due 7/24 "Unexpected Drama"
Saturday, June 03, 2017 CANCELLED - "Artistic You" Paint-Along "Summer Scene"- ACCOMPANIED KIDS WELCOME! Wednesday, April 26, 2017 Peters Twp. Library drop-off/pick-up "Window on the World"
Monday, April 24, 2017 Peters Twp. Library registration due 4/24 "Window on the World"
Thursday, March 23, 2017 Themed Exhibit--Pickup and Dropoff "Shades of Green"
Thursday, March 16, 2017 MAL Studio Themed Exhibit Registration Due "Shades of Green"
Thursday, March 09, 2017 Peters Twp. Library drop-off/pick-up "Bright Beginnings"
Monday, March 06, 2017 Peters Twp. Library registration due 3/6 "Bright Beginnings"
Saturday, January 21, 2017 "Artistic You" Paint-Along "Wonders of Winter"- KIDS WELCOME! Thursday, December 01, 2016 Themed Exhibit--Pickup and Dropoff "Multiples"
Thursday, November 24, 2016 MAL Studio Themed Exhibit Registration Due "Multiples"
Wednesday, October 26, 2016 Peters Twp. Library drop-off/pick-up "Year End Memories"
Monday, October 24, 2016 Peters Twp. Library registration due 10/24 "Year End Memories"
Thursday, September 22, 2016 Themed Exhibit--Pickup and Dropoff "Gallery Fair"
Monday, September 19, 2016 MAL Studio Themed Exhibit Registration Due - "Gallery Fair"
Wednesday, August 31, 2016 Peters Twp. Library drop-off/pick-up "Changing Seasons"
Monday, August 29, 2016 Peters Twp. Library registration due 8/29 "Changing Seasons"
Saturday, May 07, 2016 "Artistic You" Paint-Along - KIDS WELCOME! Thursday, February 12, 2015 Themed Exhibit "Line"
Thursday, February 05, 2015 Themed Exhibit "Line"
Thursday, November 06, 2014 Themed Exhibit "Summer Vacation"
Thursday, October 30, 2014 Themed Exhibit "Summer Vacation"
Thursday, October 23, 2014 Themed Exhibit "Summer Vacation"
Thursday, October 16, 2014 Themed Exhibit "Summer Vacation"
Thursday, October 09, 2014 Themed Exhibit "Summer Vacation"
Thursday, October 02, 2014 Themed Exhibit "Summer Vacation"